We know finding the right way to put across an instruction can be a tough task, but as a leading provider of great quality signs and sign fixings, we can help. Our prohibition signs will let visitors and employees know when they need to avoid doing something, whether it’s for their own safety or to comply with rules and regulations. Take a look at what we have to offer. Prohibition signs are a clear way to communicate that certain practices are not allowed within your premises. Whether you are looking to remind staff of what is expected of them or seeking to inform the public of what they can and cannot do when visiting, "no" signs send a clear message that certain behaviours are not acceptable. 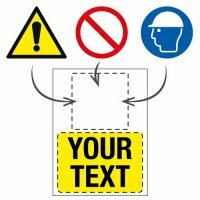 Using a classic design, with the internationally recognised circle and bar symbol to denote prohibited practices, these signs as well as our "do not" signs use verbal and pictogram information to convey your message to anyone who sees them. Prohibition signs are signs that inform staff and visitors that certain practices are prohibited on your premises. Possibly the most well-known prohibition sign is the no smoking sign, which uses the classic circle and bar motif along with a smoking cigarette pictogram and verbal warning to convey the message that smoking is not allowed in certain areas. Other prohibition signs follow the same design, using instantly-recognisable designs to draw attention and get the message across. We have specific categories focused on signs denoting no mobile phone use in certain areas, to remind people that no dogs except guide dogs are allowed on the premises, to prevent people from entering certain areas and prohibit the consumption of food and drink in others. External prohibition signs can be used to denote no parking areas with our traffic and car park signs, or to stop people from smoking, dumping rubbish and dropping litter. 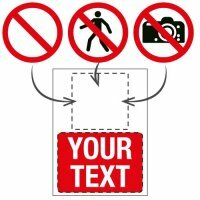 You can also use prohibition signs to control who enters the building and other areas, such as posting no children signs, no under-18s signs or no under-21s signs in areas young people should not have access to. Prohibition signs can be used to ensure health and safety practices are followed, such as in kitchens and machine rooms, where you may wish to mount a 'no watches or jewellery' sign. Waste management can also benefit from prohibition signs, which can be used in conjunction with our recycling signs to prevent the wrong types of rubbish being disposed of in the wrong bins - displaying a no food waste or no hot ashes sign above a paper recycling bin, for example. Prohibition signs can be used to help prevent accidents and injuries on your premises by instructing visitors and untrained staff not to touch potentially hazardous machinery and prohibiting staff from attempting to save time by carrying out maintenance tasks while machines are working. Prohibition signs can also be used to protect your staff from members of the public, by making it clear abuse of staff members is unacceptable. Custom prohibition signs can be used to reinforce rules and regulations that are specific to your organisation or premises. Prohibition signs can be used internally and externally to inform staff and visitors of behaviours that will not be accepted on your premises. Prohibition warning signs should be considered in areas where there may be confusion over whether a practice is allowed, or in areas where employees and members of the public are at risk of carrying out practices that are not acceptable on your premises. In warehouses, they are vital to help guide employees on expected behaviours at work and any restrictions on machinery use, you may also want to consider using non slip matting and floor marking tape in conjunction with prohibition signage where appropriate. These signs are all intended to inform people of practices that are unacceptable in certain areas. Some warning signs are used to bar entrance to certain areas based on age or category - for example, certain areas of your business may be off limits to members of the public - other prohibition signs are used to prevent behaviours within and around your premises that can create an unpleasant atmosphere for staff and customers by stopping people from smoking, swearing or dropping litter. Some Prohibition Signs are used for safety purposes to prevent workers and visitors from engaging in behaviours that may put them at risk. What Prohibition Signs do I need? The prohibition signs that you require will depend on the nature of your business, whether it be a warehouse environment or a more public setting with many visitors, we have signs that will suit the needs of the space available. 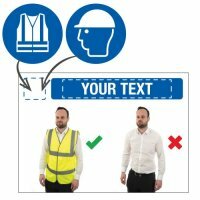 Some prohibition signs may be necessary as part of health and safety regulation and you should familiarise yourself with these requirements before installing signage. 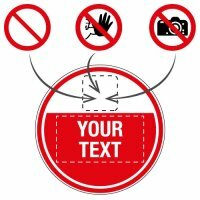 Where should Prohibition Signs be displayed? Prohibition signs should be mounted in the areas where you wish to prevent the practices described. Signage should be mounted in a position where it is easily visible to all who enter to ensure that your rules are successfully conveyed.